I am pulling some very long days as I settle into my new role. While I no longer feel clueless, each day brings unanticipated challenges. There’s an irony in spending nearly all of my waking hours (and, to be honest, most of my dream life as well) thinking about how to ensure that all New Yorkers have access to fresh, local food when I can barely find the time to feed myself. I made it home at 9:00 tonight determined to make use of the last of the remaining Katchkie Farm tomatillos gifted to me at a work event a couple of weeks ago. 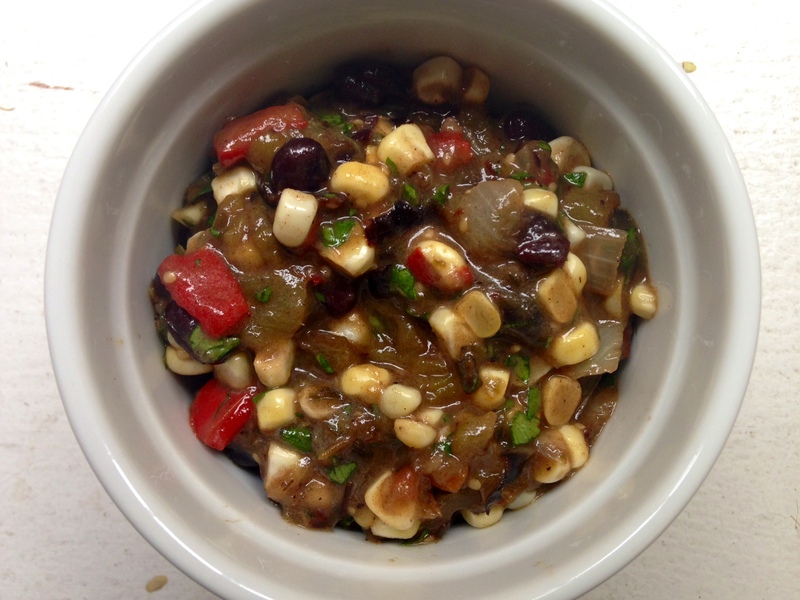 Several had already gone into Wajeedah’s Black Bean Bean & Corn Salsa Verde. Even past their prime, as they were tonight, these were some delightful fruits. Bring a cast iron skillet up to medium-low heat with a couple of tablespoons of olive oil. Remove the husks from five or so tomatillos and give them a quick rinse. Chop roughly and toss into the food processor. Add a clove of garlic and some roughly chopped hot peppers. Peppers vary in their heat and we each have our own threshold, so you’ll have to use your own judgment here. Having tasted the tip of a jalapeño and found it to be mild, I added the whole thing and also an inch or so of what I think was a serrano. The resulting dish was very spicy. Meanwhile, pan fry a few corn tortillas in your skillet, allowing them to get dark in spots and lightly salting them as they come off of the heat. Stack these and slice them into quarters or eighths. Stir your quickie tortilla chips with the hot salsa verde and pour into a low bowl. Garnish with queso fresco (or feta if that’s what you have on had), sliced avocado, roast chicken (I wish), and/or whatever your little heart desires that doesn’t further delay mealtime. A fried egg would be nice. 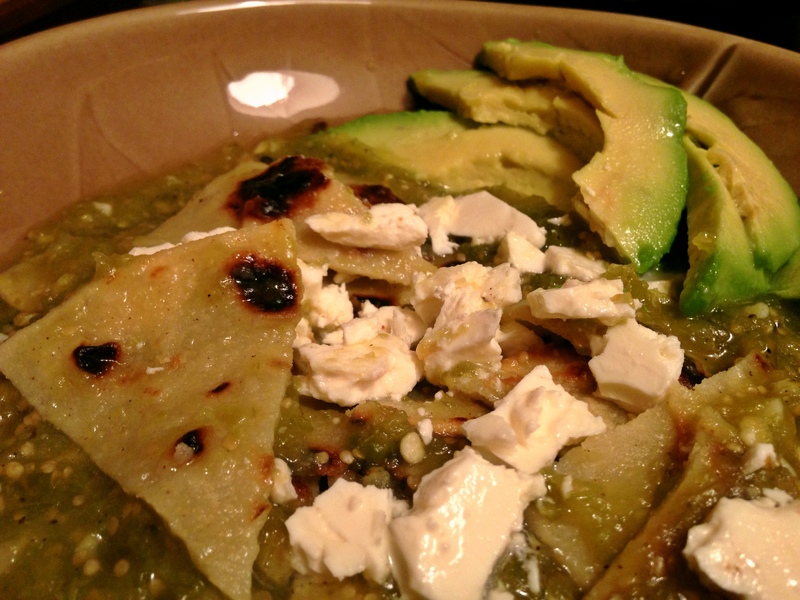 This is not a purist rendition of chilaquiles verdes, but it gets the job done in about 15 minutes, leaving you with time to give the cat some much-needed love before collapsing into bed. I had the first fundraiser for my new job on Wednesday. It was great fun, but also taxing. Nothing like a 13-hour workday that starts and ends with manual labor, in between which you have to get dolled up in a bathroom stall and then meet a few hundred people! While the event featured upwards of 60 of New York City’s finest restaurants and beverage purveyors, I arrived home ravenously hungry. (My predecessor had warned me that I should task people with making sure I ate, but somehow I failed to listen.) 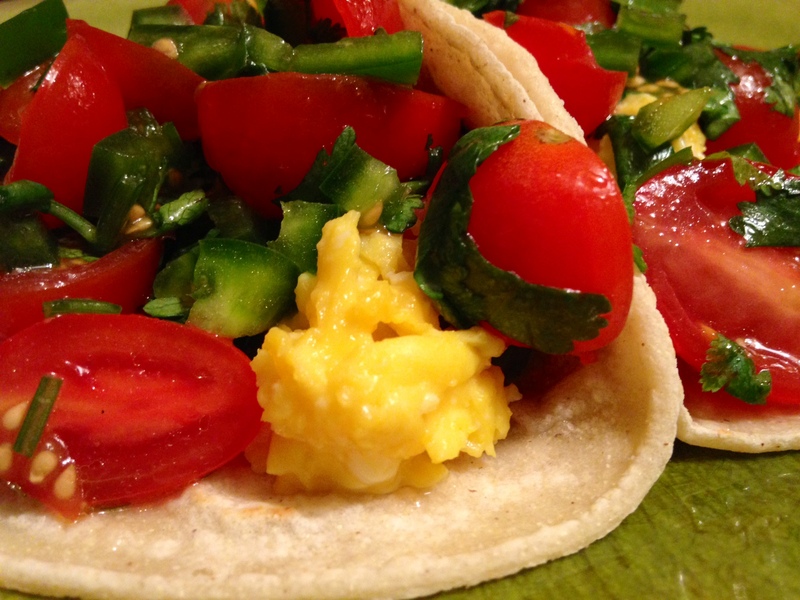 Luckily, I had tortillas, eggs, tomatoes, a jalapeño, and some cilantro on hand, which made for a lovely midnight snack. The alarm went off at 7:00am on Saturday. 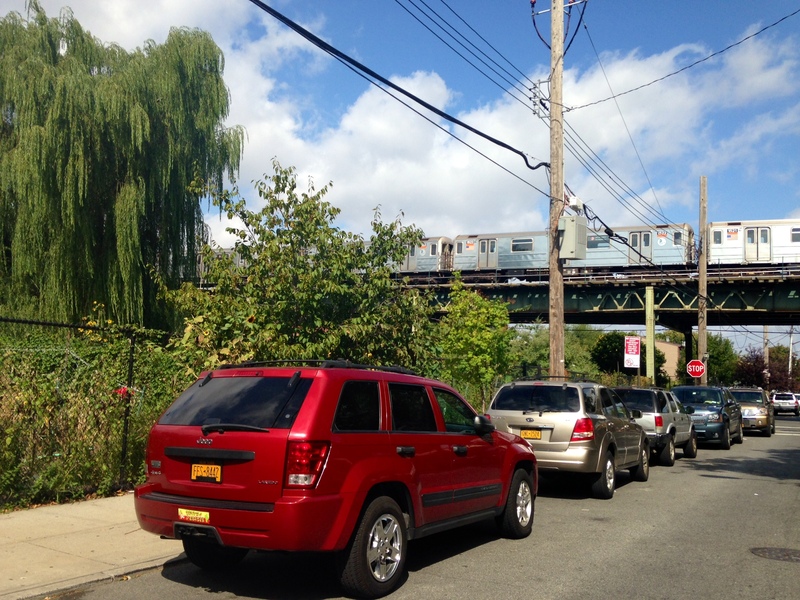 I hauled my weary body out of bed, cleaned up, downed some coffee and hopped the 3 train to the second to last stop, Van Siclen Avenue in East New York, Brooklyn. I was there to check out some of Just Food‘s programs, starting with a Meet Your Farmer event for food pantry recipients at New Hope Family Worship Center. Eileen, Nicholas and their two farmhands had risen far earlier than I had in order to make the drive down from Whistle Down Farm in Claverack, New York–the four of them crammed into a van alongside the organic vegetables that they grow especially for this site and two other food pantries in the Bronx. Many of the clients already knew the farmers, as they had visited the farm earlier in the season. Eileen and Nicholas shared a bit about their farm and the techniques that they use to grow vegetables without pesticides or chemical fertilizers. The pantry workers and clients shared their experience with the program and put in requests for vegetables they would like to see next year. Scotch bonnet peppers, greens and more Italian frying peppers topped the list, as did okra (which is apparently tough to grow in the Northeast). The event concluded with a cooking demonstration featuring the carrots that were in this week’s vegetable allotment. The pantry opened for distribution and the rest of us headed across the street to the East New York Farms! Farmers’ Market, which runs from 9:00am to 3:00pm every Saturday from late June through mid-November at Schenck Avenue and New Lots Avenue. (They run a second market on Wednesdays from 3:30 to 6:30pm at New Lots Avenue and Georgia Avenue.) In addition to a wide variety of prepared Caribbean dishes and natural health care products, the market features produce from a couple of regional farms and from nearby community gardens. I made a beeline for the Youth Farm stand, as I had sampled their Scotch bonnets in one of the few dishes I did manage to try at Wednesday’s fundraiser and was eager to get my hands on some. (That’s the farm off to the left in the picture below.) Turns out they had figs as well, which made me a very happy girl. A few stalls down, I stumbled on callaloo, which I’ve been curious to try my hand at ever since I discovered that the vegan Jamaican place around the corner from my apartment sells callaloo patties. 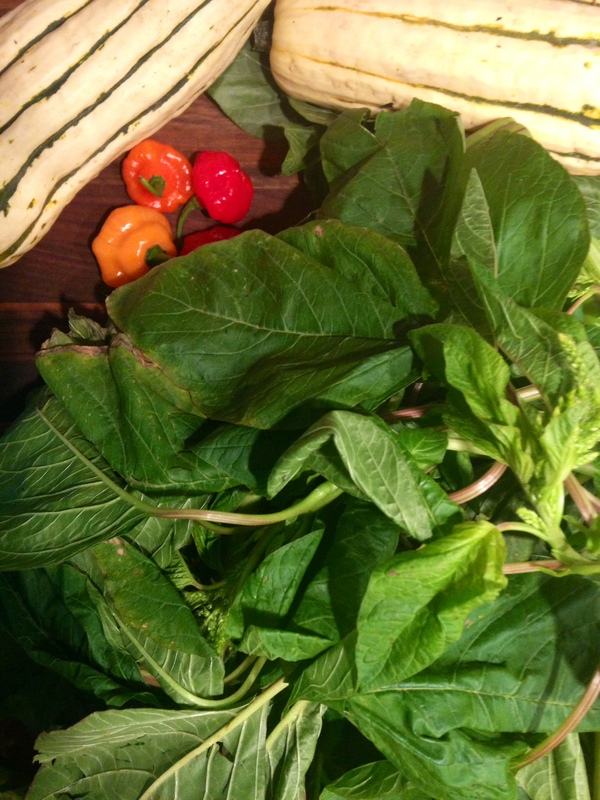 The green in question, pictured below, is actually amaranth leaves, but is commonly referred to as callaloo, which is the name of several different dishes prepared using the leaves. 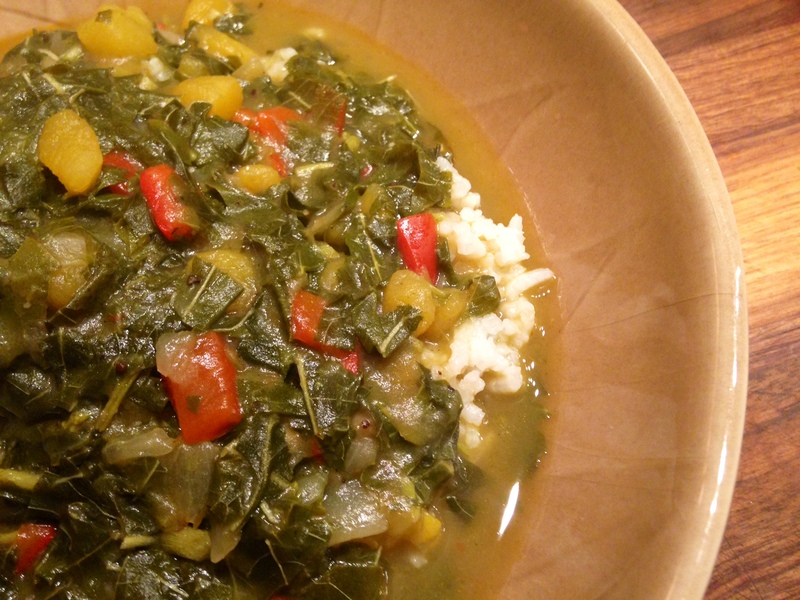 Each island seems to have its own interpretation of callaloo, so I went with my instinct and the ingredients that I happened to have on hand. Add coconut oil to large pot over medium heat. Add bacon and cook stirring continuously until partially rendered. (Do not let is get crispy.) Add onions and sauté until soft. Add bell peppers and sauté for another 5 minutes. Add thyme, allspice and garlic and cook for 1 more minute. Raise heat to high, pour in the stock and coconut milk and bring to a boil. Reduce to a simmer and add the squash and Scotch bonnet. Let simmer until squash is very tender, approximately 30 minutes. Add the greens, zest and lime juice. Let simmer for another 30 minutes or longer if you like your greens very tender. Give it a taste. Add salt and pepper to taste. If you could stand more heat, pop the Scotch bonnet open and let simmer for a while longer. Just be sure to fish it out before serving, lest someone get a major surprise. Friday morning found me trekking to South Jamaica, Queens to meet Wajeedah Anderson-Beyah at McKinley Children’s Garden. 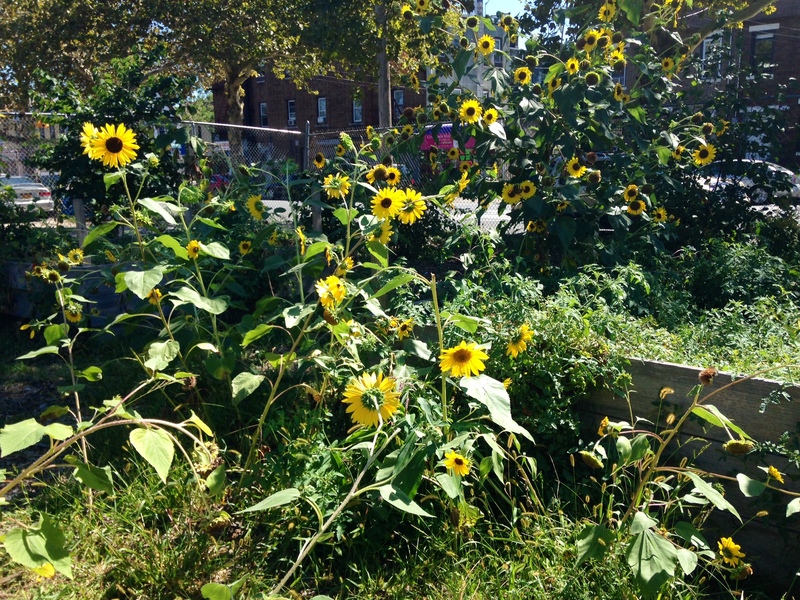 The garden is named for Wajeedah’s late husband, an urban farmer and community activist who grew up in nearby public housing and attended P.S. 40 just across the street. McKinley envisioned a space where neighborhood kids could learn about gardening and connect to nature. I am here to attest that McKinley Children’s Garden is also an oasis for overworked grownups. An hour of chatting about the garden’s educational programs, munching cherry tomatoes fresh from the vine, and learning about different techniques for container gardening did wonders for my frazzled mental state. I would have loved to have spent the day. Alas, I was due back on the 15th floor of a Midtown high-rise. Before my departure, Wajeedah tasked me with picking black beans while she gathered sunflowers and lemon balm for me to take home. While I am a serious lover of all manners of beans, it turns out that I didn’t have a clue about how they are grown. 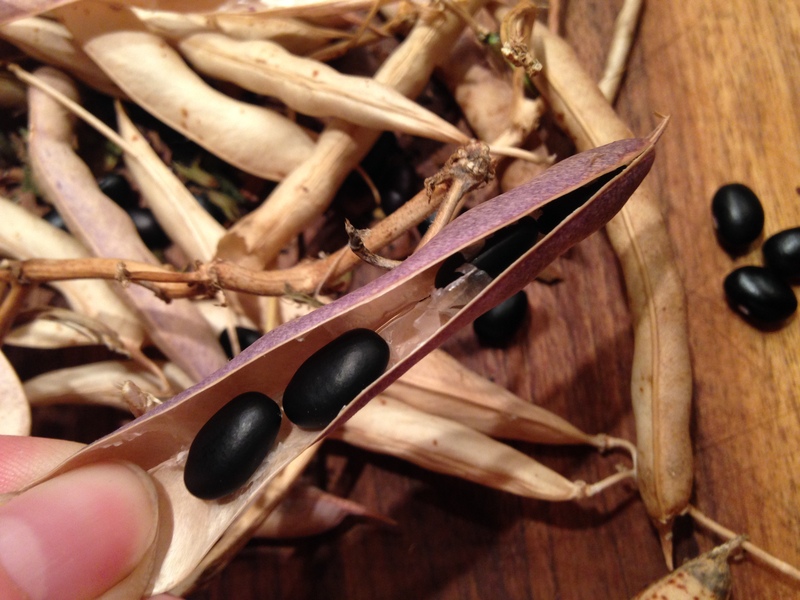 These particular beans grow in long thin pods that fade from a lovely eggplant color to white as they dry. Once dry, the pods are easily plucked from the vine. And, as I learned later that night, the small, inky beans are easy to pop out of their shell–even after several glasses of wine followed by a long and sleepy subway ride. Turn the oven up as high as it will go and get to work on the beans. Add ingredients above plus 3/4 cup water to a small pot, bring to a boil and then reduce heat. Let simmer for one hour or until beans are tender but still toothsome, adding small amounts of water as needed. Drizzle one tablespoon olive oil into a roasting pan, arrange the vegetables cut side down in a single layer, drizzle with the remaining oil, and pop into your pre-heated oven. Cook undisturbed until you have some nice charred bits, by which time your tomatillos will likely have collapsed into a mush. Finely mince the jalapeno, roughly chop everything else, and add the vegetables plus any remaining juice to a mixing bowl. Serve this as you would any salsa–as a dip with tortilla chips, as a condiment with grilled fish or meat, etc. 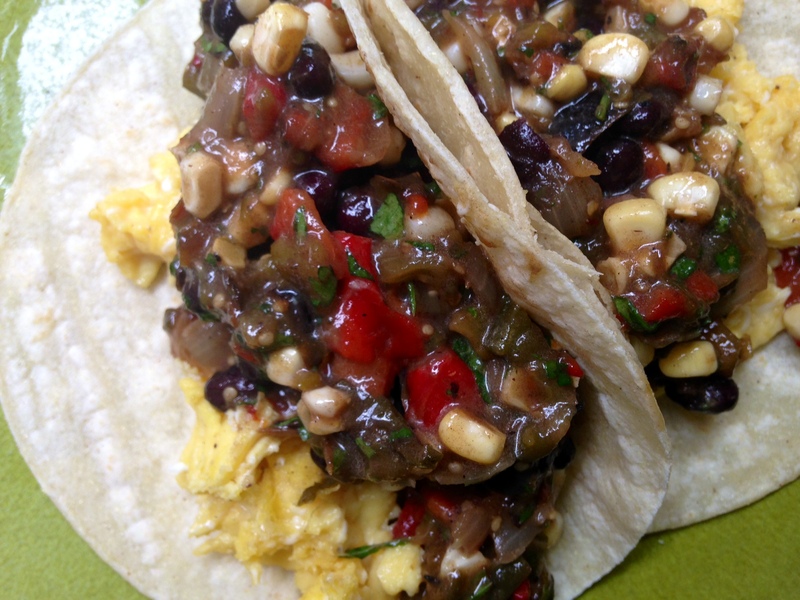 I ate some with scrambled eggs nestled inside corn tortillas. I started my new job yesterday. While having so much to do and so little knowledge of how to do it is intimidating (it will be a small miracle if I ever master our phone system), I am really excited about the work and the people. I am not, however, stoked about the location. After 14 years of working in the heart of Greenwich Village, I find myself on 43rd Street and Avenue of the Americas. Yesterday’s lunch was a couple of so-so vegetarian empanadas from a cart, consumed while rushing in between meetings. Today I braved the touristic hordes in Times Square on the hunt for a healthy and delicious lunch. The place I had sussed out online turned out to be tiny and not all that. I am mystified by the lack of even a basic grocery store in the area (and really, really need to remember to bring almonds and dried fruit from home). It seems I will be packing my lunch with far greater frequency than I have in the past. This is not a bad thing, but it will take a certain amount of forethought, particularly given that I am not much of a morning person. I left work late but determined to cook enough of something to get me through Friday. The lovely and sustainably-minded Mermaid’s Garden was about to close up shop by the time I emerged from the subway. I grabbed a pound of their succulent Carolina White Shrimp to stash in the freezer for a future food emergency and scanned the counter for something to pair with the insane quantity of tomatoes I picked up from my CSA last night. 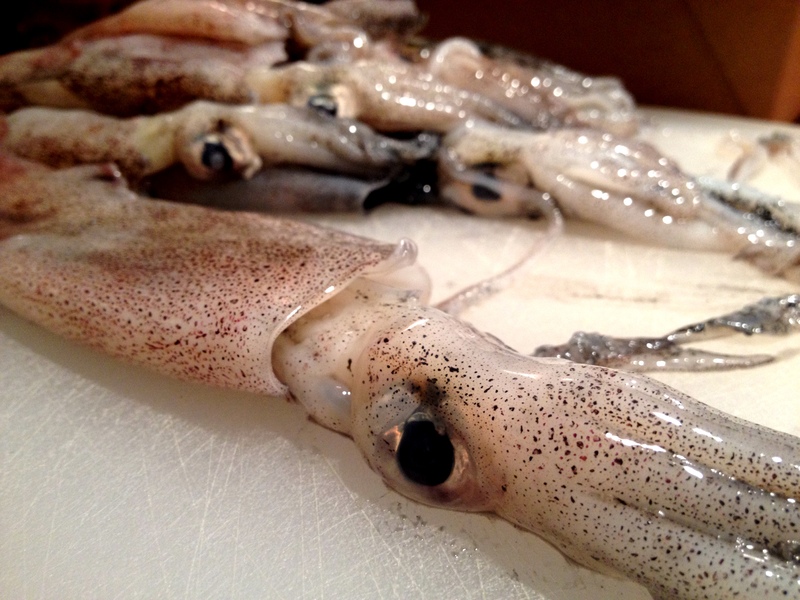 The squid from Rhode Island was only $5 a pound. Squid is generally economical, but this seemed too good to be true. Turns out it was not cleaned. The nice folks behind the counter assured me to that it wasn’t hard–separate the cap from the rest, slice off the tentacles just below the eyes, remove the plasticky hard thing (there’s probably a name for it) and, if you feel like it, peel off the skin. They assured me I could find YouTube videos if I got stuck and sent me on my way with a lemon (a charming touch). I am here to report that cleaning squid is, in fact, just as easy as promised–which is a good thing since there was no way I was going to try to stream a tutorial with my hands covered in ink and guts. Less than an hour after walking in my front door, I was sitting down to this delicious dish while my lunch for the rest of the week cooled on the counter. Place a pot of generously salted water over high heat. Bring a large skillet up to medium heat with 2 tablespoons of the olive oil. Add the onion and cook, stirring frequently, until soft and browned around the edges. Add the green pepper and continue cooking and stirring until softened. Add the garlic and red pepper flakes and cook stirring continuously for another minute or so until it smells amazing. Once your pot of water comes to a boil, add the pasta. Slide the peppers and onions to the edge of your skillet and add the remaining tablespoon of olive oil followed by the squid. Cook stirring constantly for a minute or two until the flesh is just opaque. Turn the heat all the way up and add the tomatoes, wine and a good measure of salt and pepper. 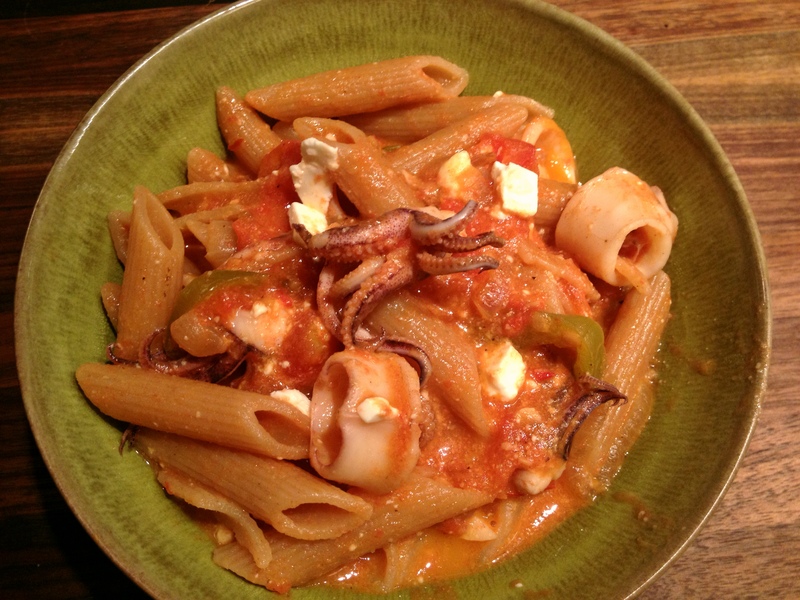 When your pasta is still a couple of minutes from being done, use a slotted spoon to transfer it directly into the squid and tomatoes to finish cooking. Remove from the heat and stir in the feta, allowing it to melt a bit and thicken your sauce. If you have some fresh herbs (parsley, oregano, basil or mint), now would be a great time to add those as well.